If you're scrawling out realms of copy on office stationary, searching for inspiration in cleaning products, or simply trying to piece together a seemingly endless FAQ page, it can be hard going. Even after that double espresso. So how do the best copywriters and creatives manage to turn functional brands from unremarkable, uninspiring and unoriginal into exciting, original and memorable? Here's a look at some of our favourite "everyday" brands that, thanks to some creative thinking (and not always a pot of gold!) have certainly succeeded in transforming their products from boring to brilliant. Tippex created a buzz back in 2010 with "A Hunter Shoots a Bear", a great little interactive video which allowed the viewer to "rewrite the story". And now they're back, celebrating their "2 year anniversary". When it comes to tone of voice, Innocent smoothies is the classic example of the "cool brand of the moment". But we think over at Method cleaning products, they're creating something pretty special. After all, who doesn't want to "High Five a Rainbow... then throw your clean, sweet-smelling hands in the air like you just don't care."? 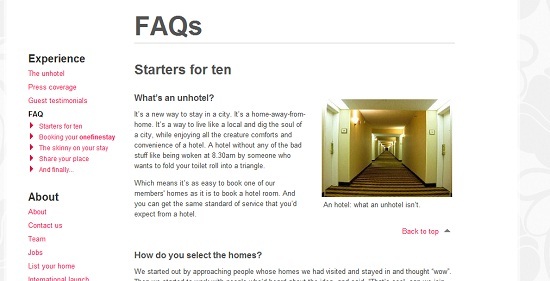 One Fine Stay - the "unhotel"
Let's face it, FAQ pages are normally quite long and boring. It's a matter of scrolling down... and down and down until you finally chance upon the information you were looking for. Yet this page from One Fine Stay is not only informative and easy to read.... but also, dare we say it, kind of funny too.